A flywheel is a round-shaped mechanical device that connects to the crankshaft which generates energy from rotation and then stores that energy for later use. In situations where the engine torque is intermittent, the flywheel will supplement this with its own stored rotational energy. You would find flywheels in cars with manual transmissions rather than automatic transmissions. Cars with automatic transmissions instead use a flexplate that also connects the transmission to the engine. The flywheel ensures that the gears of a manual vehicle are functioning properly as the driver is using the clutch. It also keeps the vehicle from vibrating so much as well. If the flywheel of your vehicle starts going bad, there are a few easily recognizable symptoms that you can watch out for. Often, as you try to change gears while driving, the gears may slip. This typically happens when attempting to shift to a higher gear (example: 3rd to 4th), the engine revs but you can tell no power is being transferred to the wheels. It’s happens more often in higher gears and when you push down the accelerator pedal more than just a little bit. This is often a direct result of a clutch that’s worn out. Allowing the clutch to slip will eventually cause the flywheel to wear out as well. If you continue to let it happen, the gear slippage will only get worse. You may start to experience grinding noises from the pressure plate and eventually, the flywheel other parts in the clutch assembly will overheat and cause them to warp or even crack. Finally, if the clutch and flywheel are not replaced, you simply won’t be able to shift at all. Riding the clutch pedal while driving, slowly engaging/disengaging the clutch while your foot is on the gas pedal, or quickly disengaging the clutch while at a high RPM (ie: drag racing) are the usual culprits to a worn out flywheel and/or clutch. A slight delay in clutch engagement or soft clutch pedal are signs of slipping gears. Aside from gear slippage, you will notice a burning smell that will consume the interior of the vehicle. This smell is generated when the clutch is being used improperly, whether from a bad flywheel or an inexperienced driver. Clutches have facings have materials intended to reduce the amount of noise the clutch makes during operation. The facings of the clutch produce a lot of heat due to friction from improper use which essentially causes the surface to glaze over from the heat. The result is a strong pungent, acrid smell that can become quite noticeable. 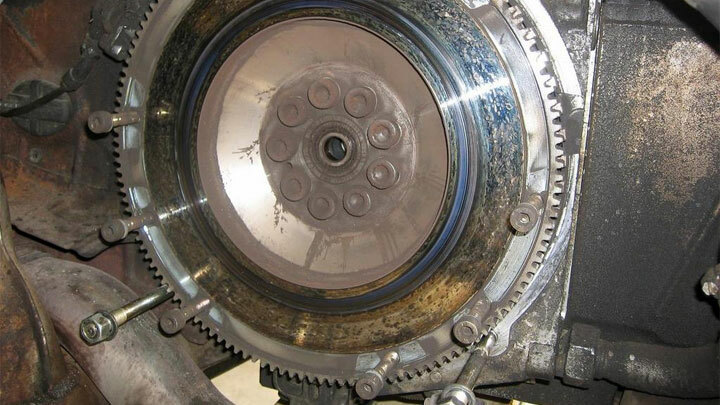 This occurs when instead of smoothly engaging, the clutch “skips” along the flywheel. It repeatedly grabs and releases which feels like a stutter or vibration when the clutch is released. While it can happen in any gear, it’s most common when starting from a complete stop. 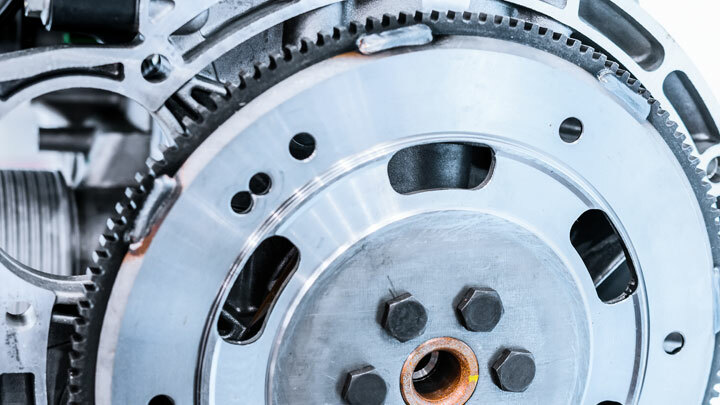 While a warped flywheel is sometimes the cause, clutch chatter can be difficult to diagnose as the clutch disc, pressure plate, or release bearing are often at fault whether the parts are worn, warped, broken, or contaminated by oil due to an engine or transmission leak. Along with this, there will be vibrations coming from the clutch pedal or floor of your vehicle each time you operate the clutch. These vibrations indicate that the flywheel’s spring mounts have gone bad. As you may know, the spring mechanism is what normally reduces the vibrations that are generated from the clutch being used. This is only more proof that you have a bad flywheel and it needs to be replaced. This is the opposite of a clutch slipping. Instead of the clutch not engaging, the clutch simply won’t completely release. You’ll experience various levels of gear grinding when attempting to change gears or even the complete failure of putting the car into first gear when starting from a standstill. Clutch drag isn’t a failure of the flywheel itself but rather the bearing or bushing in the flywheel or crankshaft assembly. So far, we’ve discussed the most common symptoms of a bad flywheel. There may be other symptoms as well but they are harder to diagnose because there are other problems which could cause them to occur. But the easy thing about recognizing the symptoms of a bad flywheel is that they’re almost all the same, no matter what type of manual transmission vehicle you are driving. The best thing for you to do is to bring your vehicle to a professional automotive technician if you notice any of these symptoms happening. The replacement cost of a flywheel can range considerably. There are some flywheel parts which only cost $35 while others cost as much as $400. It all depends on what type of car you drive and how durable the flywheel is. In addition, clutch and/or release bearing replacement may also be necessary. Then, of course, you have to consider the labor costs of doing the replacement job. Since most auto mechanics charge about $90 to $110 per hour, you could be looking at paying close to $500 just for labor. The reason for this is that the flywheel is attached to the crankshaft in an engine and it is harder for the mechanics to take out and replace. This requires more time which means you’ll be paying more money. In total, you could be looking at anywhere between $550 and $1,000. If you’re an experienced mechanic who knows how to replace a flywheel or you have a friend who is, then it would be better to use this option rather than paying for the labor. It will save you a lot of money this way.